THE VC-200PW IS A RF WIRELESS → COLOR CCD MICRO SIZE WIRELESS PINHOLE CAMERA SYSTEM, CAMERA SENSOR AND TX ARE UPGRADABLE FOR HIGH RESOLUTION, LOW LIGHT AND LONG RANGE OPERATIONS. Ideal for home or business use and can be concealed easily. Place the camera in the desired location. 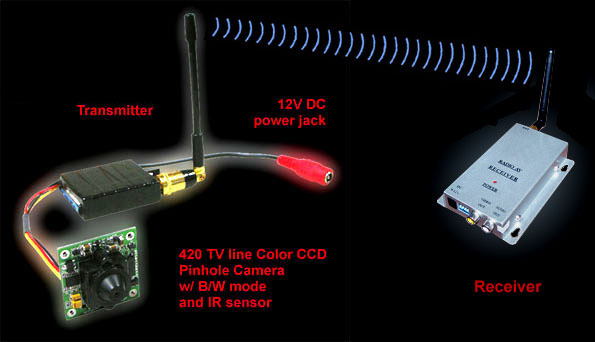 2.4GHz pinhole wireless camera transmits A/V (audio optional) signal wirelessly to the receiver. Included receiver has standard RCA A/V outputs where you can connect to a DVR or a monitor. 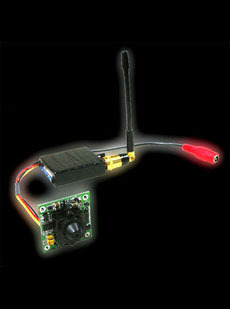 We offer you a great Wireless Camera and Receiver. By default this item uses a color camera. Are you interested in this Wireless Camera and Receiver / RF Wireless but not sure what's required for setup, how it works or you just have a general inquiry? Chat with one of our RF Wireless Specialists. "Amazing HD quality, real time high speed transmission." Q&A: Have a specific question about this Wireless Camera and Receiver? click here.